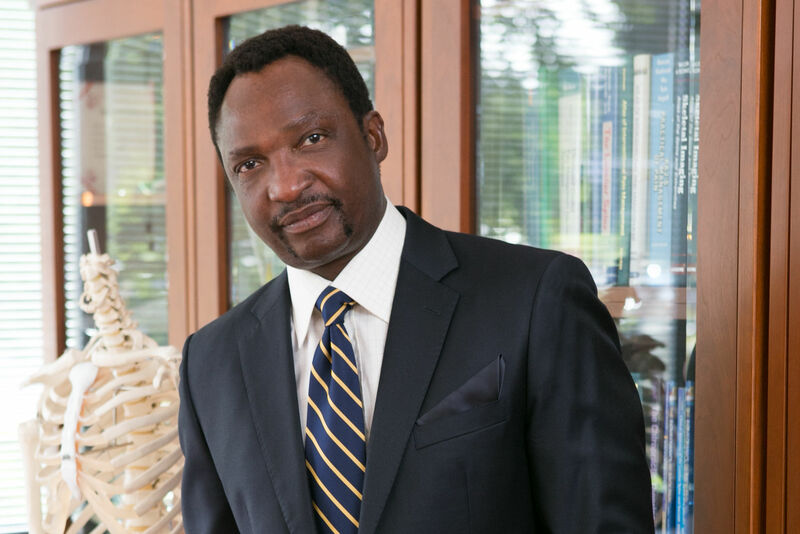 Led by founder Dr. Solomon Kamson, MD, PhD, the Spine Institute Northwest offers cutting-edge treatment options that represent the latest advances in pain medicine. By treating the underlying problem causing the pain, rather than simply alleviating the symptoms, we help patients get back their lives. Dr. Kamson specializes in minimally invasive spine surgery. These procedures offer a smaller incision, a shorter recovery time, and are able to be performed in our outpatient clinic. Many of these procedures allow patients to return home the same day, returning only for follow-up appointments instead of having to stay in a hospital. Dr. Kamson is board-certified in interventional pain medicine and has extensive experience performing laser spine surgery. In addition to working one-on-one with patients at the Spine Institute Northwest, Dr. Kamson is actively involved in the international medical community. He travels worldwide to present his clinical research and teach minimally invasive surgical techniques. Keeping up-to-date with research developments and evolving best practices helps ensure the Spine Institute Northwest can offer patients the latest treatment options for pain management. A proponent of outcomes research, Dr. Kamson and his team are always collecting data on minimally invasive procedures performed at the Spine Institute Northwest and comparing these numbers with the current literature. This enables Dr. Kamson and the Spine Institute Northwest team to track their successes and to identify areas where services and techniques can be fine-tuned, addressing areas including ambulatory surgery center quality control, surgical epidemiology, emerging technologies, and more. Data on several of the types of minimally invasive spine surgery procedures performed at the Spine Institute Northwest is shared publicly, not only for the benefit of the healthcare community but also to allow potential patients to be better informed and empowered in making choices about their care. Patients come to the Spine Institute Northwest suffering from a wide range of pain issues, from acute injuries like herniated or slipped discs to chronic conditions such as stenosis, sciatic nerve pain, and osteoarthritis. Dr. Kamson believes that early intervention is paramount to avoiding the disability that too often comes from chronic back pain. The Spine Institute Northwest offers treatment options like interventional spinal injections and regenerative therapies that can help provide relief without surgery; even minimally invasive laser surgery is only indicated when pain has failed to respond to other forms of treatment. In many cases however, patients who come to the Spine Institute Northwest have intractable pain that has failed to respond to conservative treatments like medication or physical therapy. For these patients, minimally invasive spine surgery is the next step, and they are looking for surgeons who are experienced practitioners. That's one reason why in addition to treating many people from Washington State, the Spine Institute Northwest often sees patients who feel they have exhausted the treatment options they have close to home. Looking for minimally invasive treatment in an outpatient setting, patients have traveled from as far away as Alaska and eastern Canada to seek out Dr. Kamson's expertise. Minimally invasive spine surgery offers several important benefits to patients who may feel daunted by the prospect of back surgery. These procedures can be performed in a short period of time in the outpatient clinic at the Spine Institute Northwest, allowing patients to recuperate at home and avoid a lengthy hospital stay. The procedures themselves use an extremely small incision. Endoscopy allows Dr. Kamson to work precisely, so that less tissue is disrupted. By minimizing the amount of muscle and other tissue that must be cut in order to reach the vertebrae, these minimally invasive techniques cause less bleeding and carry a lower risk of some complications than other forms of surgery. Patients also generally experience a faster recovery time, with less post-operative pain. For many patients, the first step is simply contacting the Spine Institute Northwest and speaking to one of our patient advocates. Others start by uploading their MRI or CT scan films on the Spine Institute Northwest website for a free review by one of our physicians. Dr. Kamson or another team member examines these images and follows up with a phone consultation. The ability to speak directly with an experienced physician and to have your questions and concerns addressed right away is a hallmark of the Spine Institute Northwest’s patient care philosophy. Ensuring that our prospective patients have direct access to experts helps people suffering from back pain or other chronic pain conditions to be proactive and informed in making healthcare decisions. On the Spine Institute Northwest website, you can learn more about the different procedures that are offered at our clinic, including types of minimally invasive discectomy, decompression, and fusion. The site also includes numerous patient videos, letting visitors hear what patients have to say about working with Dr. Kamson, what it's like to have minimally invasive laser surgery, and how their lives have changed. You can see patients who have recently had minimally invasive spine surgery as well as those who speak about their lives from one to even ten years after their procedures. These patients range widely in age and background, in what caused their pain, and in the kind of treatments that they received. What they all share in common is that they found relief from chronic pain at the Spine Institute Northwest. In addition to laser spine surgery, the Spine Institute Northwest team includes specialists trained in osteopathic medicine, podiatry, and sports medicine. These specialists provide interventional pain treatments for injuries and conditions affecting the joints, feet, and other areas of the body in addition to the back. Having physicians trained in different areas of medicine allows the Spine Institute Northwest team to collaborate and share their expertise, delivering coordinated, comprehensive care to patients. To learn more about the Spine Institute Northwest and hear why patients recommend working with Dr. Kamson, visit us online at www.seattleback.com, or call 425-689-7077.